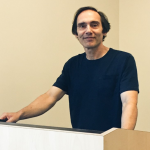 Andrew Zissos (PhD Princeton University, 1997) is Associate Professor and Chair of the Classics School of Humanities at the University of Irvine. His main research interests are Latin epic, imperial Roman culture, and classical reception. Andrew Zissos is the author of "Allusion and Narrative Possibility in the Argonautica of Valerius Flaccus", CPh 94 (1999): 289-301; "Terminal Middle: the Argonautica of Valerius Flaccus“, in: S. Kyriakidis (ed., 2004). The Middle in Latin Poetry, Bari: 311-44; Valerius Flaccus. Argonautica 1. Edited with Introduction, Text, Translation and Commentary. Oxford 2008; "Navigating Power: the Argonautica of Valerius Flaccus", in: W. Dominik / J. Garthwaite / P. H. Roche (eds. 2009). Writing Politics in Imperial Rome, Leiden: 351-66; and the editor of A Companion to the Flavian Age of Imperial Rome. Chichester 2016.